In my previous article I covered all that we can possibly know, and declared that science is the best way to separate fact from fiction- i.e. to make our internal map of reality (practical reality) as accurate as possible. This article explores why science can be trusted, frequent criticisms of science, and its limitations. As children we believe what we’re told. The faster we learn, the more likely we are to survive. 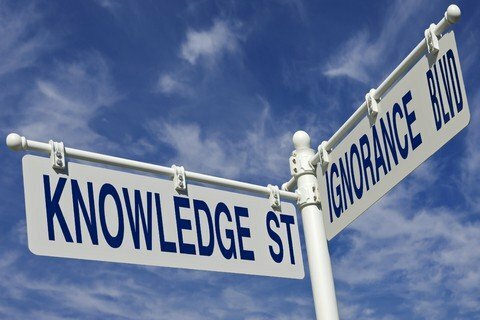 It is more important to learn what works than what is factual. Learning from our parents is a sensible survival technique- after all; they survived long enough to have us. However accuracy is sacrificed for speed. We also have to cope with incomplete data. Rather than understand in detail how the world works, it is sufficient to take short cuts to establish simply what works. The brain is very quick at filling in the blanks- as mentioned previously the brain is a cognitive miser. For example, my dog as a puppy barked at its reflection in a book case. This annoyed me, so I would put her outside. She learnt that in order to get outside, she should wander over to bark at the dog in the book case. This filling in the blanks is the foundation for our superstitions. The more detailed our beliefs, and the longer they are established, the more resistant the mind is to letting go. The subconscious mind will respond to a contradiction to a core belief as if it is an attack. To change this belief requires pulling down and rebuilding neural connections. The subconscious mind will feed biased information to the conscious mind to protect existing beliefs and attack contradictory beliefs. This results in confirmation and disconfirmation bias- when we see something we agree with, we don’t question it but take it as further proof we are correct. When we encounter something we disagree with, we look for flaws and dismiss it quickly. These are some of our many cognitive biases that make us poor thinkers. The result of this is a long list of cognitive biases resulting in a huge number of logical fallacies that makes it difficult for us to accurately assess data and form accurate beliefs. Consequently we should expect much of what we know to be inaccurate and worthy of questioning. 2) I trust science because it is open and maintains traceability. The integrity of the data, the process of analysis is set out step by step. Anyone can review it, anyone can work to replicate or debunk it. Anyone can question it. We don’t simply have to take the results on faith. 3) I trust science because it is methodical and logical. It takes single steps and applies logic to build new knowledge on previously confirmed knowledge. It checks all the possibilities that we can conceive, and only the fittest survive. 4) I trust science because it never assumes it is final. It accepts that it is only making maps. Maps can constantly be refined with greater and greater detail. In science we quantify the accuracy and level of error. 5) Lastly, I trust science because it has a proven track record. Not just at making things work, but also at finding out when it is wrong, admitting its mistakes, back-tracking and correcting. Discovering errors is celebrated. Science works through competition. The following are some criticisms of science I have heard in frequent forums. I will get this one out of the way first, because anyone who thinks this will not hang on until the end. According to doctrine, Satan works through the temptation of hearts and minds of people. This manifests for example as denial, lying and cheating (especially when a person lies to themselves). Human cognitive and emotional biases are the tools of operation. i.e. emotion is the tool of Satan. Anything that removes these biases helps to remove the influence of Satan. Science is a methodology to identify the truth. It is based on the assumption that people cannot be trusted. They engage in wishful thinking, greed, bias- i.e. the tools of Satan. Scientific methodology is all about removing bias and focussing on the evidence. Science shines the light on the truth. If you believe that God created the universe, then science is the tool to understand that creation. If Satan is present anywhere, it is with the people who would deny reality as discovered by science in order to satisfy their emotional desires. Science denial is the tool of the devil. In the early days science was quite straightforward as we were studying things we experienced in our daily lives. Common sense however should not be confused with the laws of physics. Common sense is built from our daily experience, which is extremely limited. This leads to what is known as anthropic bias. There is no reason to expect the tiny scale of subatomic physics, or the massive scale of galaxies to work the way we experience reality at our scale. This assumes time is linear and eternal. Time is a dimension of time-space (the universe) and the start of the universe would be the start of time. “Before” is an oxymoron (at least for our time). Note also that time is something, so the words “something from nothing” is actually an oxymoron- there never was “a time of nothing”, so you can’t come from it. Firstly, scientists have observed and measured effects happening before causes, which again shows that time is not as linear as we experience. Secondly, we see effects having causes all around us, but this is not telling us that effects must have causes, but that causes must have effects– a “cause” is some kind of energy transfer, and conservation of energy means that the energy must go somewhere. At the quantum level we see spontaneous decay of radioactive materials, and spontaneous creation of virtual particles- effects without causes. Mathematically we can represent these particles with “0=1-1”. As long as the total energy of this equation is zero, then there is no need to put energy in to start it- that would add energy. So a zero energy event needs no cause. The total energy of the universe may be zero, in which case a universe could start without a cause. Cause and effect also requires time to be in motion already, so “cause and effect” seems meaningless for the start of time itself. We are used to designing the things we need and seeing things fall apart. They don’t usually fall together. 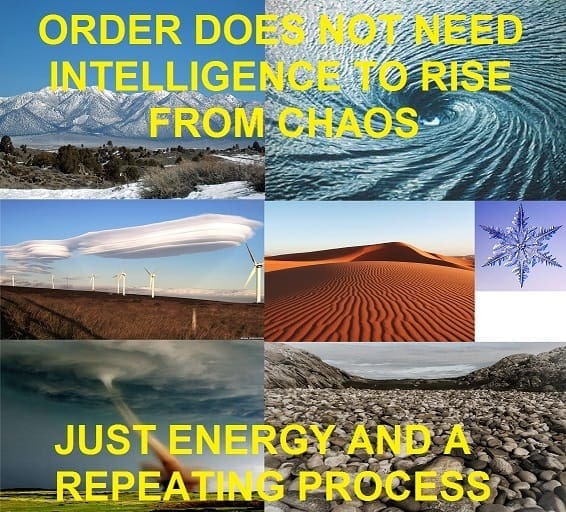 Yet if we look close enough we are surrounded by order rising from simple, mindless processes all the time. Snowflakes, mountains, clouds, sand dunes, waves and tornadoes are some examples. A bit further beyond we have gravity forming stars and planets, fundamental forces forming atomic structures. 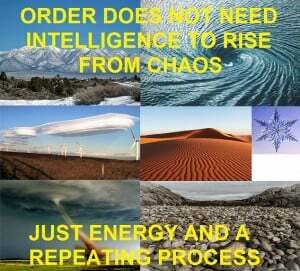 All we need to form order from chaos is energy and a repeating process. A rock falls into a river and it is shaped into a non-random shape. It is sorted with other rocks in a non-random fashion. The energy is from the moving water, which also provides the repetition. Life on Earth receives abundant energy from the Sun. The cycles of days and seasons provide the repetition- 1.5 trillion days so far for life on Earth. In all of science we have only discovered four fundamental forces. Dark energy may be a fifth. Putting aside dark energy and the expansion of the universe, everything else we see can be explained by these four mindless forces. We have trouble comprehending an infinite universe (which is one option for the universe) or a finite universe that doesn’t have a boundary. This is a very presumptuous statement, since most people haven’t stopped to define life, which turns out to be quite difficult (there are more than twenty here). When we do, we end up with a collection of properties that we bundle together with the label “life”. 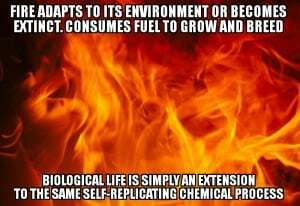 Taking just one definition “an organismic state characterized by capacity for metabolism, growth, reaction to stimuli, and reproduction”- By this definition, fire is alive, which shows just how difficult it is to define. We can get fire from non-fire. 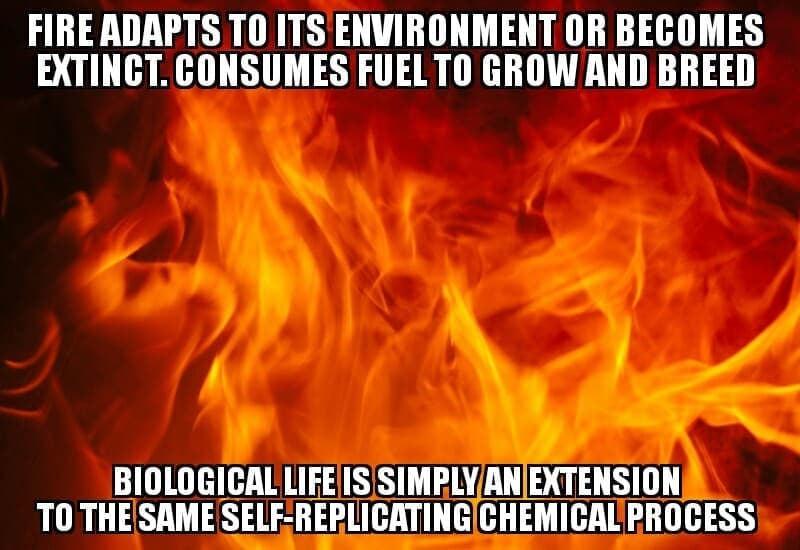 Aerobic life is an extension of the chemical process that makes up fire. What we find is that there is nothing in science stopping biological chemistry from coming from non-biological chemistry. So we see in the various examples above that there is little that is sensible about “common sense”. In related news- atoms cannot have colour, “solid” is an illusion (so we should shouldn’t expect subatomic particles to be particles at all), matter is organised energy, and the universe is constantly expanding into nothing. We aren’t observing Mars with our own eyes, but we have a trustworthy data source. Replication of an experiment definitely helps in science, but that doesn’t stop evidence being evidence and analysis being rigorous- it is still science. This claim is a red herring fallacy. 4) Isn’t consensus a logical fallacy? The logical fallacy of argumentum ad populum (also called the bandwagon fallacy) occurs when someone believes something simply because someone else does. When multiple experts all independently assess data and agree with a conclusion, that is not a fallacy, but a validation. When the majority of leading experts in a field all agree, there is still a chance they are wrong, but unless you are an expert in the field yourself, with an evidence-based, scientifically tested counter-theory, they have the highest chance of being correct. By definition this is true. However if we believe in something metaphysical, where has this belief come from? From the first article we see our beliefs can only come from the imagination, or the senses. Our external senses all work via physical processes, and so are within the realm of science. In the case where we are proposing a metaphysical phenomenon that interacts with the physical world (such as performing miracles, answering prayer, manifesting itself), then science can measure the impact. In the case of a god that is supposed to be the creator of the entire universe, then we would expect our scientific study of the universe to continuously and unavoidably converge on the evidence and objectives of that god. Every aspect of the universe should consistently meet the intended function of the designer- form follows function. So if a religion is not compatible with science fact, then the religion is fiction. Our internal senses such as balance and hunger also have a physical component via the nerves, but it becomes trickier to measure them. Our feelings are even more difficult, since they are located within the brain. This does not make science impossible, just much harder. A metaphysical being that wanted to interact with us could conceivably communicate directly to our mind, perhaps via a dedicated sense for this purpose. (In fact logically this is exactly what we should expect- see footnote.) Science would have great difficulty in detecting this, but conceivably brain scans would reveal something- they might or might not tell the difference between imagination and a sense. If instead we propose a metaphysical phenomenon that has no physical effect whatsoever, then we have exhausted all possible sources for belief in this phenomenon- it can only come from the imagination. Absolutely true. In which case, such measurements remain the targets for ongoing science, as we improve our abilities. There is always more to learn. Some things however will never have the evidence to allow us to do anything more than speculate. 7) But speculations are beliefs from the imagination, right? Just like religion? A speculation should not be considered a belief- only a possibility. Ideally it should be assigned a probability. A common error is to assume that if you can only imagine one possibility, then it must be the truth. This may be true, or it is highly possible the universe is more mazing than your limited imagination. The foundation of the speculation is also important- does it have a firmly established base, or is it built on a logical error? Is it wishful thinking? Speculation plays a vital role in science- without it you cannot form a hypothesis, develop predictions or develop theories. However a hypothesis always starts with observation, and until you can follow it up with testable predictions, it will never move beyond speculation. A true religion would be able to establish its credibility through science. Faith is used to defend an existing belief. A belief based on evidence can be defended logically from the evidence. An appeal to faith is an admission of insufficient evidence. We then must ask: what is the basis for the belief in the first place? If a belief does not come from some source of evidence, then the only place it can come from is the imagination. Science communication is poor at explaining science. This is made more difficult by the large variation in the level of scientific literacy in the community. Science terminology is frequently misunderstood. For example a scientific theory is an accepted explanation of observed facts. It is often mistaken with a hypothesis (a proposed explanation). An accepted theory with no competing theories is the crowning glory in science. A fact is an observation (evidence), and so a theory cannot ever be a fact. Significant in science (statistics) simply means measurable, not large. Not all scientific announcements are the same. It is important to tell the difference between “a recent study suggests” and “an agreed theory with no competing theories.” It is important to see the level of confidence behind the announcement. It takes time to go from an initial discovery (of which there are many) to a widely accepted theory (of which there are few). I would love to see scientific announcements with a “certainty meter” on them- was the evidence robust? Is there consensus? Are there any competing theories? It is also important to spot the difference between a scientific statement and a media announcement, as science is often misunderstood or poorly reported. Refinement does not equal wrong– corrections and improvements to science are not the same as “being wrong”. This is a false dichotomy fallacy. Adding detail to a sketch doesn’t make the original sketch wrong- just less accurate than the update. For example, when climate change models were extended to account for heat absorption by the oceans, some media announced the IPCC scientists were in crisis, that they were wrong and their predictions had failed. The misleading implication being that global warming wasn’t happening at all. The long, slow process of public acceptance of climate change shows just how difficult science communication is. Both evolution and the big bang are robustly proven, yet much of the public believes these are contentious. Science starts with the evidence. Claims such as “there is no evidence for evolution” fail from the outset. The theory of evolution explains the overwhelming observed facts of evolution. The big bang theory explains the overwhelming observed facts relating to the expanding universe. – The big bang theory does not tell us the universe started from nothing. It doesn’t even tell us if the universe started. It doesn’t cover the “conception” of the universe. – The theory of evolution does not tell us how life started- that is outside the scope of the theory, and is the subject of abiogenesis. We have now established a robust framework for forming evidence based beliefs, resulting in a world map which is as close to reality as possible. Science- we can trust it because it works, and it works because it doesn’t trust us. Consider that if a god exists and has something to tell us, direct revelation (i.e. a direct connection to our mind, perhaps via a dedicated sense for this purpose) would be the most reliable and therefore logical form of communication. A god that wanted to communicate with everyone could do this with his all of its own creations. A false religion could not do this. Science would have great difficulty in detecting this, but conceivably brain scans would reveal something- they might or might not tell the difference between imagination and a sense. Our only doubt about this contact would depend on how we think, which a god would also have designed. This would be the most reliable way for a god to communicate to us individually- better than manifestation which relies on the physical senses. If we all experienced this, we could all agree with each other. Our popular religious texts then beg the question what the motivation would be for a genuine god to only talk to an occasional individual (which is excellent evidence for the individual but results in unmeasurable and unrepeatable evidence), who must document their experience (introducing error), which is then transcribed (more error), translated (more error), distributed (error through unreliability), and then read (error through mapping). There is no logical reason why we would expect anyone to believe the original individual, and of course these days when someone claims to hear voices, we simply don’t believe them.